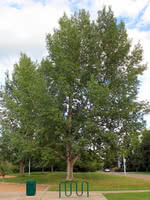 Green Giant Poplar - also known as Brooks #6 - is a large, prairie hardy tree ideally suited to shelterbelts. Cold tolerance, drought tolerance, and disease resistance make the green giant a perfect fit for anyone looking for a low maintenance tree. 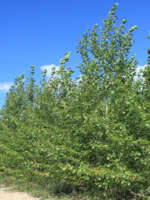 This hybrid poplar variety produces no fuzz.